MELVILLE, N.Y., March 21, 2019 /PRNewswire/ -- SupplyHouse.com, an e-commerce company that sells plumbing, heating and HVAC supplies, recently wrapped up their month-long clothing drive. They partnered with ACLD (Adults and Children with Learning and Developmental Disabilities) in running a clothing drive for ACLD's RewearAble program, a green initiative that reuses and repurposes every single donation it receives regardless of condition. ACLD is a not-for-profit agency that provides opportunities for adults and children with developmental and learning disabilities to increase their independence and assist them with pursuing their passions. 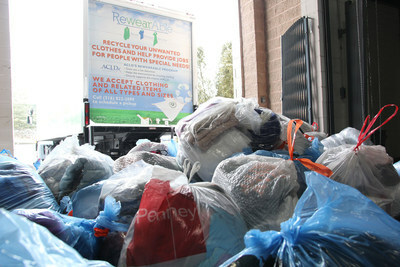 From February through March, SupplyHouse.com employees donated 112 bags of clothing to ACLD's RewearAble program. Donations included bedding, clothing, rugs, purses, stuffed animals, and other similar items, totaling more than 1,800 pounds. "I knew we received a lot of donations, but I didn't fully grasp the extent of it," said Raquel Sosnovich, who assisted in organizing the drive. "At SupplyHouse.com, we often talk about how success alone isn't enough unless we can help others along the way, and that's just what we work to do every day," Sosnovich continued. RewearAble provides meaningful employment for people with disabilities. It is run entirely by people who sort and wash the clothes, schedule pickups, organize the drives, and more. "I think this initiative was really special because not only did we donate clothes to the less fortunate, but we provided jobs for adults with learning and developmental disabilities," said Amanda Scialabba, who also assisted in organizing the event. "Working with the RewearAble program is a cycle of giving back to the community. It furthers our investment in our company's core values. We have this wonderful company, so why not use it to make a difference?!" SupplyHouse.com coordinates numerous giving back events throughout the year, aimed at helping the community. As a company, they work hard every day to create a long-lasting, positive impact.